Soft Skull Press, 9781619029408, 240pp. When Oliver Bonds, a revered religious studies professor at the University of Texas, loses his toddler son and undergoes intense legal scrutiny over his involvement, grief engulfs him completely. His life is upended; Oliver loses his wife, home, and faith. Three years after his son's death, Oliver lives in a shack without electricity and frequents the soup kitchen where he used to volunteer. It's only when befriended by Lyle, a con artist with a passion for theories of Hollow Earth, that Oliver begins to reengage with the world. Oliver too becomes convinced that the inside of the planet might contain a different realm. Desperate to find a place where he can escape his past, Oliver chases after the most unlikely of miracles. With unforgettable characters, wild imagery, and dark humor, Hollow explores the depths of doubt and hope, stretching past grief and into the space where we truly begin to heal. 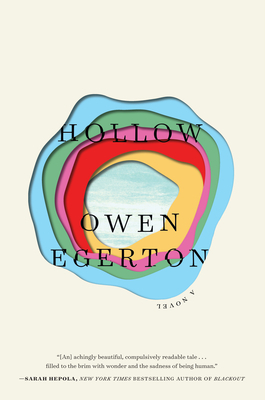 OWEN EGERTON is the author of two novels, The Book of Harold and Everyone Says That at the End of the World, and one story collection, How Best to Avoid Dying. He's also the writer/director of the psychological horror film Follow. As a screenwriter, Egerton has written for Fox, Disney, and Warner Brothers. His pieces have appeared in The Huffington Post and Salon. He cowrote the creative writing guide This Word Now with his wife, poet Jodi Egerton. Egerton also hosts NPR's The Write Up.